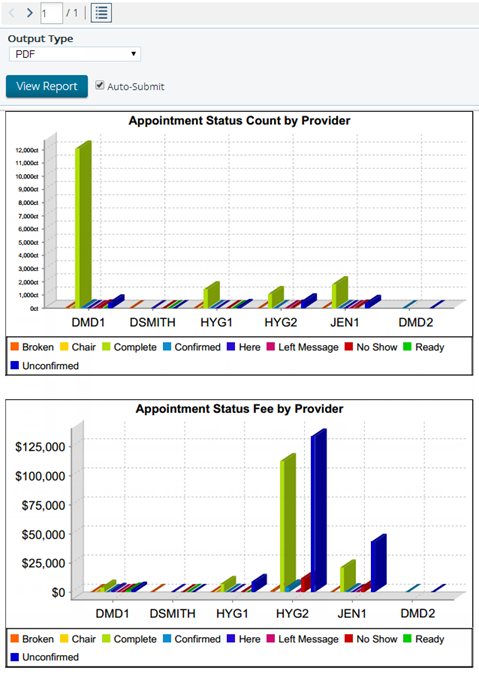 The Appointment Status by Providers Report displays two graphs: one represents, for each provider, the number of appointments with each of the specified statuses; the other represents, for each provider, the scheduled production from the appointments with each of the specified statuses. On the Power Reporting page, click (or tap) the Appointment Status By Providers icon. Select the Output Type: HTML (Paginated), HTML (Single Page), PDF, Excel, Excel 2007, Comma Separated Value, Rich-Text Format, or Text. If the Auto-Submit check box is clear, click (or tap) View Report to preview or download the report (depending on the output type). Otherwise, skip this step. For either of the HTML output types or the PDF output type (if a PDF-reader extension is installed), a preview of the report appears in the report-viewing area. You can print or save a PDF document being displayed in the report-viewing area. 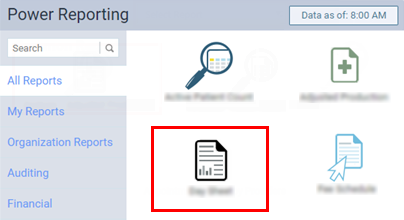 Tip: You can show or hide the report options at the top to reduce or increase the available area for viewing the report by clicking (or tapping) the Report Parameters button . For the Excel, Excel 2007, Comma Separated Value, Rich-Text Format, Text, or PDF (if a PDF-reader extension is not installed) output types, a document is downloaded to your computer. You can then open and print the document if desired.